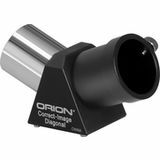 Orion dielectric mirror diagonals are our highest quality diagonals, and a very good upgrade for that extra bit of performance in a refractor or schmidt cassegrain telescope. Features 99 percent reflectivity and extremely durable coatings. 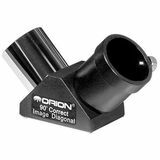 With their twist-tight clamping mechanisms, Orion Dielectric Twist-Tight Mirror Star Diagonals present a significant upgrade from typical thumbscrew-equipped diagonals. Boasting 99% reflectivity, these are the perfect diagonals for peak performance. The mirror in this 1.25" Orion Enhanced Star Diagonal has been meticulously polished and features enhanced aluminum coatings to yield excellent 97% reflectivity. 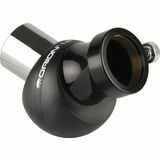 It fits 1.25" focusers and accepts 1.25" eyepieces. 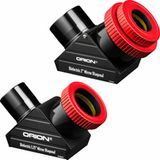 Ideal for refractor telescopes. 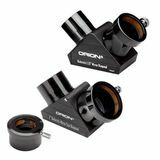 The 2" Orion Refractor Mirror Diagonal has a meticulously polished mirror to yield maximum performance. 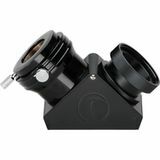 It fits 2" focusers, accepts 2" telescope eyepieces and includes a 1.25" eyepiece adapter. Not recommended for use in reflector telescopes. 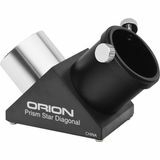 The 1.25" Orion Correct-Image Star Diagonal is perfect for terrestrial use or for amateur astronomers who want a view that matches the orientation of a star chart. Turn any refractor or Maksutov-Cassegrain telescope into a high-performance spotting scope! The Deluxe 45-degree Correct-Image Prism Diagonal transmits a right-side-up, correct left-to-right view. Not recommended for use with Newtonian reflectors. 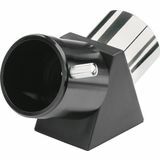 Coronado BF-5 right angle (1.25" diagonal) type secondary blocking filter. The blocking filter is the second element in any Coronado H-alpha system, it is just as crucial to your safety and the system's performance as the front element. 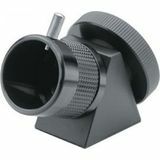 Coronado BF-10 right angle (1.25" diagonal) type secondary blocking filter. The blocking filter is the second element in any Coronado H-alpha system, it is just as crucial to your safety and the system's performance as the front element. 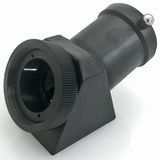 Coronado BF-15 right angle (1.25" diagonal) type secondary blocking filter. The blocking filter is the second element in any Coronado H-alpha system, it is just as crucial to your safety and the system's performance as the front element. Meade #918A Diagonal Mirror (1.25") #07202. Diverts light 90 degrees to the telescope's main tube, permitting a more comfortable viewing position. 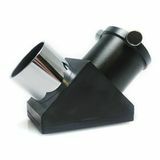 Meade Model 932 Image Erecting Prism #07210 for ETX-90 and ETX-125. Produces a correctly oriented image and convenient 45-deg observing angle for terrestrial observations. Meade Model 928 Image Erecting Prism for Meade refracting telescopes #07217. 1.25"" barrel. Produces a correctly oriented image and convenient 45-deg observing angle for terrestrial observations. Meade Model 933 Image Erecting Prism for ETX-60, ETX-70 and ETX-80 Models. Produces a correctly oriented image and convenient 45-deg observing angle for terrestrial observations. A great item for a home with a view or nature watching. 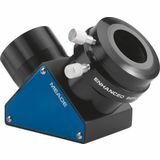 Meade Series 5000 2"" Enhanced Diagonal Mirror #07680. 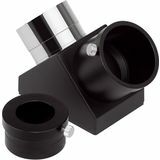 Our best diagonal for Meade LX90 and LX200 models. Features an incredible 99% reflectivity over the visual spectrum. 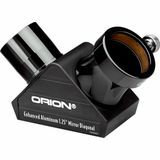 Celestron's 2" XLT Diagonal boasts high performance StarBright XLT coatings, allowing you to take full advantage of the wider field of view provided by 2" eyepieces. 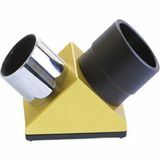 A telescope diagonal uses mirrors or prisms to redirect the beam of light upward — usually by 45 or 90 degrees — for more convenient viewing with refractor or Cassegrain telescopes. 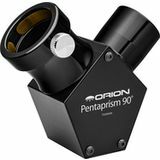 Orion Telescopes carries top-quality prism and mirror diagonals in both 1.25" and 2" sizes, including some with enhanced, ultra-high reflectivity optical coatings. While many diagonals produce a backwards view, our correct-image diagonals provide a correctly oriented image, which is practical for terrestrial viewing.